The large vertically directed 50-MHz radar at Jicamarca has sufficient sensitivity to study nighttime echoes from the equatorial electrojet in detail with good resolution. Here we concentrate on type 1 (‘two-stream’) echoes. We find that (1) these echoes sometimes dominate the spectrum (which is never the case in daytime for a vertically directed radar), (2) they are observed over a much wider range of altitudes than they are during daytime, (3) they show an asymmetry which reverses from day to night (downgoing waves are more common at night), (4) the magnitude of the mean Doppler shift appears to increase somewhat with altitude, and (5) there is evidence of large-scale (kilometers) structure as well as intermediate (tens or hundreds of meters) and small (the wavelengths of meters or less which are directly responsible for radar echoes). We describe a model which qualitatively accounts for all the important characteristics of the observations. Long and intermediate waves with roughly horizontal k are initially unstable, and a complicated two-dimensional energy cascade process develops, with energy transfers probably going in both directions in k space. The asymmetry in the echoes can be explained if either the density depletions at the intermediate wavelengths are stronger than the enhancements or the positive density gradients are steeper than the negative. Farley, D. T., B. G. Fejer and B. B. Balsely, Radar observations of two dimensional turbulence in the equatorial electrojet, 3. 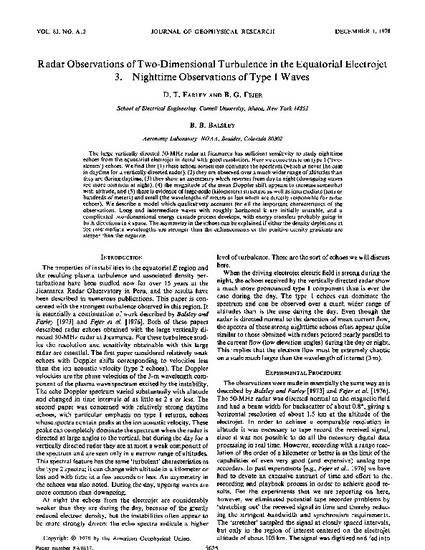 Nighttime observations of type I waves, J. Geophys. Res., 83, 5625, 1978.